A Graduated Neutral Density Filter are not like the Neutral Density filters I have talked about in the past. Those cut the light into the entire lens opening. A graduated ND filter, is dark on one side and gradually goes to clear about half way down the filter. They come in two sizes. Circular sizes screw right on to a lens like any other filter. Square ones are larger and cover more than the lens opening allowing one to move the graduated part around. While you can get holders for the square filters, most photographers prefer to hold the filter in front of the lens. 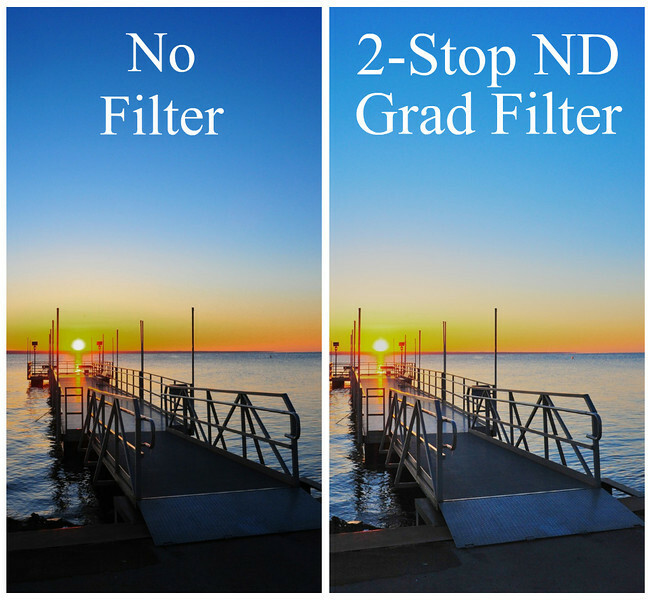 GND Filter comparison of a sunrise on Oneida Lake near Syracuse, New York. It is not as straight forward as you might think. The trick I finally learned was to use the Depth of Field Preview Button on my camera (see your manual for where this button is located on your camera and how to use it). Once pressed, I could see the effects of the filter. If I did not press the DoF Preview button, I could not see it (or just barely). The camera keeps the aperture of a lens wide open for focusing purposes only stopping down the lens when you press the shutter. The DoF Preview button stops down the lens to the aperture set so you can see the effects of a filter or tell what is in focus based on the aperture used. I know many people would rather just do the work in their favorite photo editor. That takes time. In my case, it took me 10 minutes to get the photo on the left you see above to look like the one on the right. The right side one only took a couple of minutes to do a little sharpening and pull back highlights and shadows. That time adds up if you have a dozen or more photos to process. For more expert advice on how to use a Graduated Neutral Density (GND) filter, click here to visit Landscape Photographer extraordinaire Jeff Lynch’s blog. This entry was posted in Nature, Photography and tagged 28-300mm, cokin, depth of field, graduated neutral denisty filter, horizon, kits, new york, nikon D700, oneida lake, preview button, steel pier, sun, sunrise, syracuse, vr, water. Bookmark the permalink. Great comparison! To be honest, though, I like everything above the horizon better in the no-filter image (the blue of the sky is prettier and the sun seems better exposed)…. and I like everything below the horizon better in the image WITH the filter, because the foreground isn’t as dark. Interesting. I like above and below on the right. The left is underexposed do to the bright sunlight which is the reason for the deeper colors of the sky. The right is more true to what I was seeing at the location. HDR or some other blending processing would also do the work but that would take even more time and resource space (3 to 5 expoures for HDR and the creation of a large TIFF file for either process). Lots of ways to get to work these images and scene. I actually thought the exact same thing as Michaela! I can’t see how the 2-stop ND grad didn’t give you the darker sky like on the left, unless you changed your camera settings to compensate. I understand the point you were trying to illustrate here, just not sure this it the best example to do so as the foreground details (the ramp, etc.) really aren’t worth high-lighting. This image should be all about that sky and setting sun which I find works in the image without the ND filter. The flickr photo I posted today is a better example of the filter’s use. Didn’t have a non-filter example to go with it. I would imagine the bench and statue would have been in silhouette or the sunrise totally blown out depending on how I exposed for the scene. Yeah, no issues with offering up constructive critism. You’ll probably be seeing me do more of that as now I am feeling the sting of having to have closed my studio partly due to the economy and partly due to the fact that every Joe-Schmo out there with a digital camera thinks they are a ‘photographer’. I wish they all knew the damage they are doing to those of us who are actually trying to make a living at it. It would benefit me to have this when I was shooting my dad’s garden 2 weeks ago as the sky was overly exposed. I might consider getting one, I’m just not a huge fan of filter though. This one is as well as close available as you can get returning to the valid thing. techniques being well because conditioning that includes the serve of each of our dummy. Now a you have an idea of what you need, start aiming around.